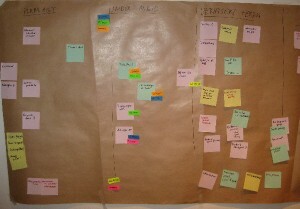 Every Scrum-team should use their taskboard to support their particular way of working. I’d like to share the way we use our taskboard at my current project for your inspiration. For tasks that we discover during the iteration, we use the red pen. 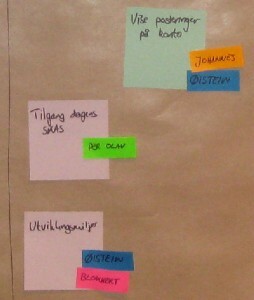 The color codes for the tasks are the same. We don’t write names on tasks. Instead, each of the three team members have three sticky bookmarks of a color (green, blue, orange) that they can place on stuff they work on. We limit the number of bookmarks per person to limit multitasking. We use the red sticky bookmarks for tasks that are blocked. That is, tasks where the team needs outside help. We’ve limited ourselves to three red bookmarks. When we’d like to place the fourth, we’d rather spend our time following up the current blockers. Since we had some spare area on our taskboard, we decided to use this to look for improvements to our process. We believe that improvements shouldn’t wait until the retrospectives. Instead, we want to think of how to get better all the time. We use the green pen for improvements. Impediments that cause extra work or defects go on red notes, things that would make us work better go on green, and neat ideas that would be fun to try go on yellow notes. Finally, we have an area for impediments. We haven’t come up with a system for this yet, so we just use arbitrary color notes and pens. We’re always looking for ways to improve the taskboard further. In particular, I’d like to use the blue pen for something. I’m also not totally happy with the division into different sort of tasks. Finally, I’d like to have a special sort of sticky for things that don’t really take time, but that we need to remember to do, like sending out meeting invitations. How do you customize your taskboard to our team’s process?